Brussels, 23 November 1999 – One week before European negotiators head to the World Trade Organization meeting in Seattle, Médecins Sans Frontières (MSF) calls on the EU to make public health a priority in international trade rules. Infectious diseases kill 17 million people every year, most of them in the developing world. Many of these diseases are treatable but the necessary drugs are either too costly or no longer produced. In addition research for tropical diseases has nearly stopped. MSF reports released today comparing prices of AZT and fluconazole (used to treat life-threatening AIDS-related meningitis) around the world show that it is possible to produce affordable medicines in poor countries. In Thailand fluconazole costs $US 0.70 per day, whereas in Kenya it costs $US 20 per day. This is because the drug is patented in Kenya, which means only one company has the right to produce it. “Current trade laws have a direct impact on peoples’ lives. In Thailand patients can afford treatment, whereas in Kenya they cannot” said Dr James Orbinski, President of MSF’s International Council. To challenge this imbalance, MSF today launched the campaign for Access to Essential Medicines. The MSF campaign will also focus on restarting stalled research and development for tropical diseases. The search for cures of diseases that affect people in poor countries has ground to a standstill. Of 1,233 new drugs brought to market between 1975 and 1997 only 13 were for tropical diseases. While the highly profitable pharmaceutical industry concentrates on making treatments for impotence and obesity, doctors treating patients with diseases such as tuberculosis, malaria and sleeping sickness are forced to use archaic treatments developed 30-50 years ago. MSF is calling for direct involvement and financial support from the EU to stimulate research and development for medicines for communicable diseases. 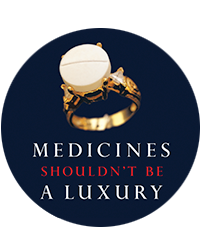 “Access to medicines is a matter of life and death. The EU must take action now to ensure that health is a priority in trade agreements and that new treatments are developed for neglected diseases” said Dr Pécoul. MSF was awarded the 1999 Nobel Peace Prize for its work in providing medical assistance and speaking out for populations in danger.